When I read the solution offered by Wayne LaPierre, the CEO of the National Rifle Association, to the ever-growing number of massacres at schools—that we need “good guys” with guns to protect us from “bad guys” with guns—I initially thought he was joking, a bad joke, yet joking nonetheless. But when he and his fellow gunmen went on to say, in all seriousness, that schools, because they are gun-free zones, are pretty much asking for it, I felt myself being pushed once again into that wild region of our public discourse that, no matter how hard I try, I am unable to enter by taking my opponent’s standpoint in imagination. What routinely follows in such articles is a sentence or two about the invincible power of lobbyists who work for the NRA today. This is a forgone conclusion—how they, aided and abetted by the gun-manufacturing lobby, spend millions of dollars a year to defeat legislation that would ban, let alone regulate, devastating assault weapons like the one used to murder the six women and twenty little children at the elementary school in Connecticut. Whenever I read such things I ask myself, is the gun lobby literally buying the men and women who represent us in Congress, that is, bribing them to do their bidding? And then I wonder how “lobbying” can be legal. I also wonder if it was legal for the Colt gun manufacturing company to blackmail Connecticut in 2009 by threatening to close their factories and move out of the state if lawmakers passed a bill requiring markers on guns that would make them easier to trace. If this kind of strong-arm tactic is legal, why isn’t it illegal? And if it is illegal, why weren’t the men in charge of the Colt gun manufacturing company prosecuted for extortion or racketeering or some crime on that order? Which makes me think of an article I read in the New York Times the other day. I learned that it is a felony to lie about one’s criminal history on background-check forms when trying to purchase a gun. Then I read that close to 80,000 would-be gun-buyers lied and were denied guns in 2010, yet only 44 (!) of them were charged with a crime. Is this what it means to live in a state of anarchy, that those who are entrusted to enforce our laws simply look the other way? I think of how the New York City Department of Buildings issues violations for code infractions but does not enforce them, about how many times after a building collapses and people are killed I have read in the newspaper that there were hundreds of outstanding violations against the slumlord’s property. How, I wondered, have we fallen into this condition of state-sanctioned lawlessness? And this makes me think of the Pew Research poll I recently came across in the Times—after the mass murder in Connecticut, 49 percent of the people who were interviewed say that gun control is more important than protecting the right of Americans to own guns, while 42 percent believe that gun ownership is more important. I also read the staggering statistic that there are now 310,000,000 guns in circulation and 30,000 deaths by guns a year, and that a new study conducted by the National Research Council and Institute of Medicine found that the rate of firearm homicides is 20 times higher in our country than in 23 other countries, and that Americans younger than 50 are much more likely than their contemporaries living elsewhere to die from gun violence (and car accidents and drug overdoses as well). It made me cringe when I read that military-style, auto-loading, assault rifles—like the one used in Newtown and that had been banned until 2004—are now the most popular rifle in the country; and that as legislators at both the state and federal level, finally shamed by the murder of first-graders, are acting to “do something,” there has been a frenzied buying spree among gun enthusiasts. I wonder what those who buy deadly assault weapons are thinking and recall the strange incongruity of a 23-year-old man named Patrick Mason, identified by the Times as an assistant manager at a yoga studio in Las Vegas, explaining why he fires an assault rifle with 500 rounds of ammunition in the desert: “I don't want to shoot holes in pieces of paper, I want to watch a watermelon be destroyed.” Yoga and blowing up watermelons. And of course there are those hunters who enjoy shooting animals for sport using these same killing machines—not to mention those men and women who apparently believe we are now living in the kind of nightmarish, helter-skelter world that requires them, in the name of self-defense, to stockpile weapons intended for modern warfare. And then there is always the predictable invocation of the right to bear arms guaranteed by the Constitution. As anyone familiar with the history of the founding of our republic knows, the Second Amendment came into existence in a pre-modern world of citizen militias as opposed to a standing or what we would today call a professional army. Those who fought to have it added to the Bill of Rights would no doubt be astounded to learn that the Second Amendment is now the justification used by individuals who apparently think it is a good idea to carry unconcealed weapons wherever and whenever they please, like that group of a dozen men who showed up at a rally for President Obama in Arizona a few years ago, ostentatiously outfitted with firearms, and one of their number with a semi-automatic assault rifle slung over his shoulder told the local newspaper that he was carrying the rifle because “in Arizona, I still have some freedoms.” Which brought to mind those people who also apparently think it is a good idea to have a law like Florida’s “Stand Your Ground” bill that says you can shoot first and ask questions later, which encouraged George Zimmerman to think he was in the right when he shot and killed Trayvon Martin as the teenage boy was walking back to his father’s home after buying some candy at a store. It was then that I remembered a letter to the editor in the Times about the Newtown massacre that argued for the repeal of the Second Amendment on the grounds that it had become “a dangerous anachronism,” which sounded eminently sensible to me. I thought how glad I was to live in New York where gun-control laws are among the strictest in the country. But gun control in one state, I couldn’t help thinking, is like recycling in one household. 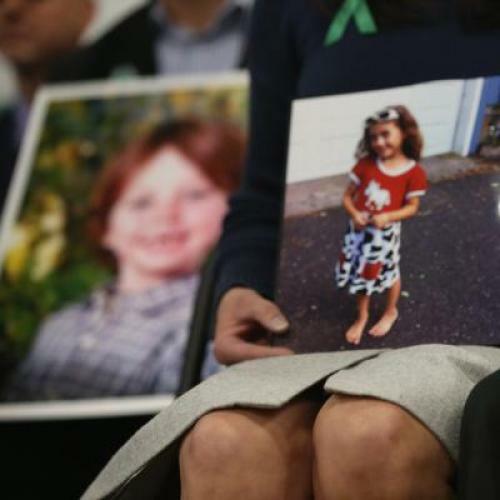 And then before I could stop the hideous scene from entering into my mind, I found myself imagining what that extraordinarily brave young woman, Victoria Soto, who threw herself in front of the little children in her classroom at Sandy Hook elementary school must have felt at that terrifying moment. Which returned me to the men who run the NRA and their 4,000,000 members: How have they come to wield so much power? And yet I have heard pundits remark that, during the last election, only a handful of candidates backed by NRA money were elected and how the defeat of the many others is supposed to signal that the NRA is not so powerful as we have been led to believe. But, what, I wonder, does that mean? That voters could not be bought, but that our representatives in Congress in both parties can be? But then individual voters were not being offered money the way individual Congressmen and women as well as candidates for public office apparently are. If a voter on route to the polling place were offered money, would he or she take it? I guess it would depend on how much money. Why do our representatives allow themselves to be bought? Is it really because they will do anything to stay in office? But then why do they want to stay in office if they are merely lackeys of powerful interests and cannot do whatever good they must have set out to do when they originally ran for office? Just as I am hearing the rejoinder that such people are only interested in money and power and am feeling embarrassed at my own naiveté, I think of Jane Addams. I remember her account in Twenty Years at Hull House of her sense of shame, her mortification, that certain businessmen tried to bribe her to use her influence with some residents at Hull House who were working to pass factory legislation, whereas her father, who had been a member of the Illinois State Senate between 1854 and 1870, was known to be a man of such unimpeachable integrity that no one ever dared to offer him money. Addams did not hesitate to refuse her would-be benefactors—a response no doubt at least some of our representatives are still capable of. Yet, is there anyone among us today who would wonder, as Addams did, “What had befallen the daughter of my father that such a thing could happen to her?” What “weakness” in her had “permitted” someone even to offer her a bribe? Is this lack of awareness, this moral insensibility, what it means to be corrupted? Does participation in a political system such as ours ultimately wear away our capacity to recognize what we are doing, who we have become? My mind wanders for a moment and I think of how in the 1960s Harold Rosenberg denounced the exhibition catalogue as part of the promotional machinery of the burgeoning art-entertainment industry, and how today artists, even those with the most integrity, regard the catalogue as a legitimate—and desirable—record of their work. Which reminds me of Leslie Stephen’s reservations—in the 1890s—concerning the posthumous publication of letters that his dear friend James Russell Lowell wrote to him in which Lowell praised Stephen’s writing or expressed personal affection for him. Stephen worried that his permitting the letters to be published might be construed as putting himself forward. I remember how I felt caught up short by my own insensibility when I first read Stephen and Rosenberg, that their concerns, like Addams’s, had become entirely foreign, even quaint, to me, and wished that it was natural—instead of an act of historical imagination—for me to feel how they felt. Again I wondered if this is what it meant to be corrupted. By this point I felt pretty much demoralized and decided to escape these dreary reflections and listen to the radio. It was just my luck—or was it a sign of our times?—that the first thing I heard was the news that the $50 billion bill to provide aid to the people in New York, New Jersey, and Connecticut whose lives have been wrecked by the relentless winds and surging waters of the latest hurricane was still being debated in the House and that Republicans like Rick Mulvaney and Tom McClintock were trying to block its passage. Which brought me back to the third night after the storm, when my husband and I decided to head uptown to stay with generous friends who still had electricity and heat and water. We walked to their house on 49th Street up a transformed 3rd Avenue with no illuminated buildings or traffic signals, crowded with people all moving in the same direction with determination, in pairs and in groups, everyone with a backpack or suitcase and shopping bags. I recalled the way traffic in every direction as far as we could see had come to a complete standstill, horns honking, sirens blaring, cops hopelessly gesturing to cars, and that I told my husband we were now living in the future that has been visited upon us by decades of mass consumption in the name of comfort and ease—heating and air conditioning, cars and airplanes, fast food and styrofoam containers. In my current mood, I could not help but think of how our leaders, who like to envision America as the leader of the world, will not sign any of the international agreements that would slow the melting of the icebergs and the burning of the ozone layer, that in Washington such treaties are somehow regarded as an affront to our sovereignty, our rights, our freedom. And I wonder what people who say such things mean, which makes me think about how the habitual language of individual rights is so constricted that it cannot take account of, or even recognize, the far more dire consequences—public, moral, and aesthetic—of polluting our world. Which makes me think again of the gun people, who also regard any law that might make the world we inhabit together less deadly as some kind of affront to their freedom—as if their freedom to do God knows what takes precedence over everything else—and I once again feel the crippling impoverishment of our sense of our common life, what used to be called our commonwealth. And then before I know it I find myself picturing all the public figures who made speeches holding back their tears about those poor children in Newtown, I hear all the talk about how much this country cares about children, and I feel myself sinking into cynicism at the spectacle of adults who will not lift a finger to protect these children—not only when it comes to ridding our society of military assault rifles that turn classrooms and malls and movie theatres into killing fields but also to making sure that all children receive the same education and health care that only wealthy children currently receive. At which point the National Institute of Health report comes back to me with its scandalous news that living in America today means you are destined to have a shorter life than men and women who live in 17 other “developed” countries (“average life expectancy” of American men and women ranked last and next to the last respectively) and that “even the people most likely to be healthy, like college-educated Americans and those with high incomes, fare worse on many health indicators.” That night, as I was dutifully placing our newspapers and recycling bags on the street for pick-up, I recalled that the government report raised the question whether “cultural factors like individualism and dislike of government interference play a role” in these matters of life and death, and that the newspaper reporter observed that these were “less conventional explanations.” Then I noticed, as I always do, how few of our neighbors bother to recycle, only to immediately feel how ridiculous such a thought was, how my individual, measly act of recycling is nothing in the face of the collective actions and change of heart (if that is the right word) that are now required to save what is left of our world.